Geneva, San Cesario Sul Panaro – 1st March 2019. Pagani Automobili announces the 20th Anniversary since the presentation of the Zonda C12 at the Geneva International Motor Show with the world premiere of the very first chassis of Zonda having been completely restored. 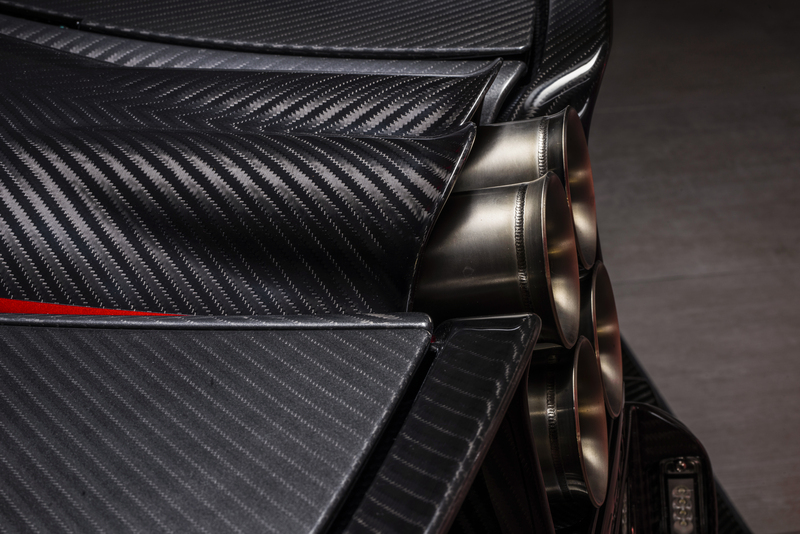 Plus, an extremely rare example of the Pagani Huayra Roadster with a special, unique finish to the carbon fibre body, on display at the 89th edition of the Show. The 2019 motor show marks a very special moment in the history of Pagani Automobili. Twenty years have elapsed since that 1999 Geneva Auto Show when the world discovered a Zonda, the C12, for the very first time. A futuristic and revolutionary car in some respect, with the glass roof and the deep, curved screen, one had the impression of sitting in the pointy end of a fighter jet; purely designed to convey strong emotions from the very first moment it was encountered. Immediately identified as a clear break from the automotive establishment at the time, so much so, as to deserve the new name of hypercar on purpose, the Pagani Zonda has easily become one of the most celebrated cars over the last 20 years. Each of its different variants being recognized with many important awards and setting speed records on some of the most challenging race circuits in the world. The tale of this supercar is pure emotion: the project took shape in the late ‘90s; a time of critical economic changes and new global regulations. In such a scenario, several difficulties of a shrinking market play against the rise of new initiatives. Supporting heavy investments for the production of relatively few examples of a car was not only an extreme challenge, but also requires an act of courage. It is against this background that the Zonda was born from the fusion of nerve, sacrifice, and passion; this marks the beginning of the Pagani Automobili adventure in the automotive world, after 9 years of profound in-depth, innovative studies and refinement. In the Modenese workshop, the painstaking manual skill of the Florentine, Renaissance-like craftsmen, combined with the technologies found only in F1 cars and space rockets. In Modena, the homeland of the most beloved sports cars of all time. Zonda is the first street-legal car made by the Modenese Atelier, a synthesis of the forefront of technology combined with the utmost care for detail, created with passion and, moreover, a radical new way of thinking about the design of a supercar. Even today Zonda embodies the quintessence of Pagani Automobili’s core values: it combines emotion with functionality, art with science, at every step of the creation. Above all, Zonda tells the story between a young designer and the great Juan Manuel Fangio, a legendary Formula 1 World Champion, a great friend and mentor, fundamental in supporting the dreams of Horacio Pagani. Just 140 street legal examples in total since 1999. Each with its own soul, each like a bespoke suit stitched exclusively around the client’s own tastes. The ultimate rarity of these cars allows them to remarkably increase their value over time, turning out to be great investments. And with the goal of safeguarding this investment, Pagani has started the programmes Pagani Rinascimento and Pagani Puro; designed not only for restoring, certifying, and preserving the Pagani vehicle authenticity but also to enhance their value year after year. Last but not least, the two programmes provide warranty extensions. In this spirit, the Pagani Atelier is born from the dream of a single man and his very few collaborators and partners. 20 years later it is a team of 177 enthusiasts and artisans, all pushed by that same passion; all together pursuing, with Huayra, the top exclusive production, tailoring real bespoke suits. Coming from the passion of a child, the Pagani Zonda C12 has been the first Pagani vehicle ever made by the Atelier of San Cesario sul Panaro. With a silver livery inspired by the Group C’s Silver Arrows of Mercedes Benz, it was first unveiled at the Geneva International Motor Show on the 9th March 1999 and shows an idea of a car that was completely out of the ordinary for the time. This was not just another show car on display, but a fully homologated car with an incredible amount of miles driven and tested before being unveiled to the world. And once opened, the rear carbon fibre bonnet, the majestic V12 engine appears, bearing the Mercedes Benz mark and its star. The relationship with the German company has always been based on great collaboration and mutual respect; in 20 years, it brought the official supply of the V12 engines specifically designed and hand-build for Pagani. Exactly 20 years after that day, the Atelier pays homage to the iconic supercar with the faithful restoration of the chassis n° 001, originally used for the homologation and crash tests; most of the original parts were recovered so as to restore the exact same configuration of the March 1999. Thanks to the Rinascimento Programme the car has now been brought back to its former glory; starting with the restoration of the existing parts, even the smallest of details has been renovated to pristine condition. It was also possible to rebuild the original components thanks to the precise specifications carefully stored in the Pagani archives, still kept today for every car that leaves the factory. Now today, just as in 1999, the original configuration of the Zonda shows all the art and the engineering of the carbon fibre, as well as the beautiful combination of other advanced composite materials that on the C12 were used for the entire construction of the central monocoque and the body panels. The tub and passenger cell, in fact, had already been recognized by 13 different patents before the unveiling and the use of composite materials in a project with such innovative aspects and processes, made this car one of the safest in the world. The laboratory of new technologies that was Pagani Automobili, kept pursuing this non-stop experimentation and development over the last 20 years, striving towards continuous improvements in terms of stiffness and lightness on all materials. Chassis 001 is equipped with the prestigious and original Mercedes-Benz 6 litre V12 engine with an output of 450 hp, which in the early 2000s allowed to achieve excellent results in terms of performance and set lap records on some of the most important circuits of the world. The meticulous artisanal work was carried out on the mechanics of the car, on the electronic systems, and in fact on just about every component of the car to recover the authentic look and functionality. From the suspension, right down to the screws and bolts, as well as the rims, the wheel hubs, and the unmistakable four exhaust pipes that have become the brand’s signature: each element has been restored, identically, to the original configuration of the first Zonda ever presented. In the livery of Puro Silver lives the spirit of a timeless wind and the interiors, inspired by past, present and future cultures, still keep their authentic essence. Restored to the letter, they will help making the Zonda C12 live the charm of the debut once more. On display at the 89th edition of the Geneva International Motor Show is also a unique example of Pagani Huayra Roadster, the current production car of the Atelier in Modena. With fully exposed Blu Tricolore carbon fiber body in a matt finish and Bianco Malta white accents to enhance its outline: this is the colour combination proposed by the carbon-fiber craftsmen of Pagani Automobili for the Huayra Roadster on display, a true example of creative taste and attention to every detail. The blue and white leather interior recalls the special features of the livery and bears witness to the continuous commitment of the company in creating unique products for its clients. With the delivery of more than half of the limited production of Huayra Roadster to the clients all over the world, the Modenese brand confirms 2018 as a record year with a 35% increase in turnover compared to the previous year, establishing itself more and more as an expanding global brand. 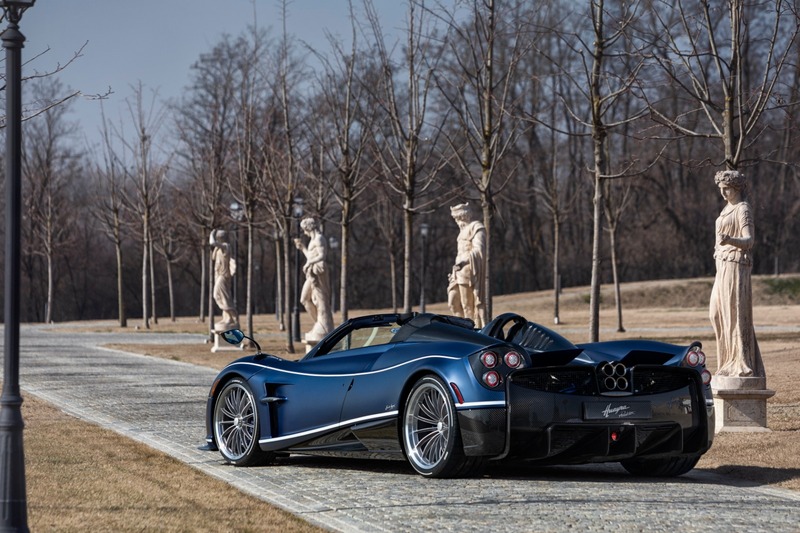 “In 2018 Pagani has been showing a strong growth of its distribution network globally, with two new showroom openings in Australia and Germany. For us, it is fundamental to be close to our clients in order to provide them with an always better service while preserving our exclusivity in each territory” – Horacio Pagani, Chief Designer. Johannesburg, South Africa, January 31st 2019. The Italian luxury manufacturer Pagani Automobili and its partner Daytona (Pty) Ltd are proud to announce that a new Pagani showroom has been opened in Johannesburg South Africa. The opening of this new brand center is an important step in bringing the Modenese Atelier experience closer to our customers in the region. Located in Melrose Arch, Johannesburg, this showroom embodies Italian style and flair, featuring the handcrafted signature Pagani furniture and details. While enjoying the best blend of Italian coffee, our customer will be able to configure their future Pagani vehicles. The latest state-of-the-art digital visualization tools combined with the smell and feel of the leather samples and the richness and depth of the colour swatches, will provide for an unforgettable configuration experience. The customer will be guided by the Pagani product experts at the dealership through the details of the Pagani products and the variety of options available. Once the skilled artisans in San Cesario complete the construction of the Pagani vehicles, delivery ceremonies are held in this inspiring environment, as privileged owners receive their bespoke Pagani creatures; often years after placing their order. ensuring owners enjoy the best service as they continue to enjoy the Pagani cars on the mesmerizing roads in South Africa. South Africa will receive its first Pagani Huayra Roadster this year and hand it over to the fortunate owner. All allocations are sold out for the next two years. Horacio Pagani, Founder and Chief Designer – Pagani Automobili SpA: “Opening this showroom is another milestone for Pagani. With Daytona we have found a perfect partner, that understands our philosophy and has created an amazing home for the brand in South Africa. Justin Divaris, CEO – Daytona LTD: “Adding a brand like Pagani to our already impressive Daytona stable is a huge feather in our cap. It re-affirms our position as the ultimate luxury supercar dealer in the country. Horacio Pagani, Founder and Chief Designer: “For us this new home in Beverly Hills is the crowning achievement of our long path, and it is fundamental to provide a better service to our affectionate clients of this region who share a deep passion and attachment to luxury brands. Most importantly, this represents a new significant milestone for our brand and for our presence in the country, which alone is currently covering the 40% of the Pagani global sales”. Entirely hand-built in the Atelier of San Cesario Sul Panaro, this car represents a fine example of extreme tailoring around the clients’ desires. Inspired by the elegance of the White Gyrfalcon, the largest falcon of its species, able to cover very long distances during its flights, the car recalls many of the features of this polymorphic bird. The archetypal colours of its plumage dominate the livery of the carbon fibre panels: Bianco Benny White and Blu Danubio Blue are the dominant colours, together with accents of bright yellow. The spectrum is completed with the special painting design of the front bonnet that recalls the bird’s very special beak. 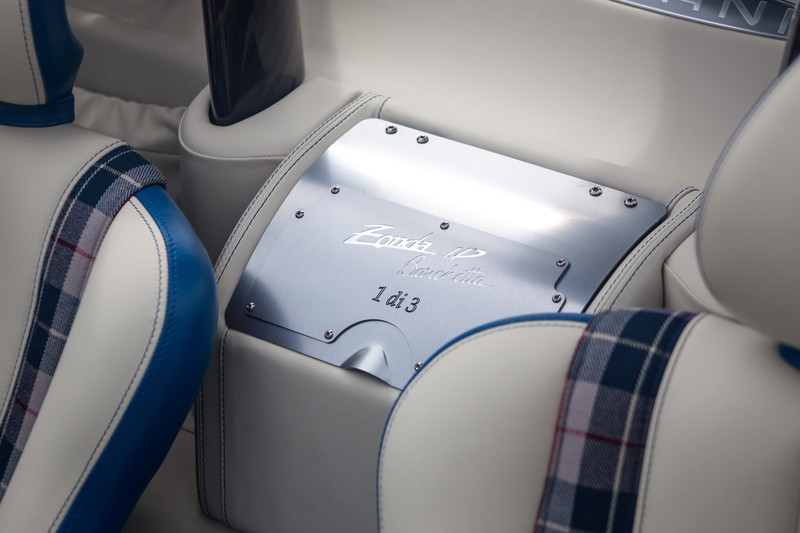 Other unique details of the upholstery have been extremely customized: a symbol of a Gyrfalcon is embroidered into the headrests, luggage, and doors and a dedicated plaque inside the car bears the inscription “Gyrfalcon”. This car reflects the factory commitment to care even the most minute of details, crafting each one to perfection in order to cater our customers’ needs and taste. The shifter knob has been redesigned specifically to house a special gold Gyrfalcon coin. “These made-to-measure supercars are well-loved in North America, not only for their intense technology and beauty but also for the appreciation of passionate Italian craftsmanship that goes into making them.” says Horacio Pagani. Pagani Automobili is pleased to announce the awarding of the Honoris Causa Master Degree to its Founder and Chief Designer Horacio Pagani. After almost 20 years since the world debut of the iconic Zonda C12, the Atelier of San Cesario Sul Panaro is preparing to celebrate another key achievement gained by its Founder, the fruit of a long study and a great deal of teamwork. The ceremony has taken place on June 19th at the “Enzo Ferrari” Faculty of Engineering of the University of Modena and Reggio Emilia. With the conferral of the honorary degree in Vehicle Engineering, the Emilian Atheneum did want to pay homage to the Argentine designer, the person who decided to link his name, and his professional and technological achievements to the Modenese territory, cradle and heart of what is today known as Motorvalley. The celebration was held at the Modena Tecnopolo and was introduced by the Academic Procession, in the person of the Rector, Professor Angelo O. Andrisano, who first stated that the event was precisely taking place 30 years after the passing of Enzo Ferrari: “A man in the myth, who brought the name of Modena over the globe, whose name now is the name of our Department of Engineering. And it is not that difficult to find similarities between the story of Horacio Pagani and Enzo’s, who both achieved excellence, who both were driven by passion and perseverance.” The University Rector has also recalled the regal decree stating the value of the Honorary Degree which can only be awarded to “People who, due to their works or publications, gained fame for the profound expertise achieved in the subjects for which the Honoris Causa Degree is conceded”. The Laudatio held by Professor Francesco Leali highlighted Horacio’s life and career key aspects, depicting a vivid visionary, a designer, and a producer, finding similarities with modern days students who are following his example by leaving the “virtual comforts” in order to create a project with their hands, something more uncomfortable but “fulfilling from an engineering point of view”. Thus Professor Leali announces Horacio Pagani’s Lectio Magistralis which, while reminding the stages of the long career, does not shrink from observing the profound love for those who have been supporting him along the way. The childhood friends, the family in Argentina, his beloved wife Cristina and sons Leonardo and Christopher; and more the colleagues of Lamborghini, among them Maurizio Ferrari, the partners Daimler and Mercedes-Benz, Bosch, and those who believed in the Zonda project and provided support for the launch of this revolutionary work. Then he thanked the Pagani Team, all the colleagues who share today his same passion, and finally the city of Modena, the place where the young designer long dreamt to come to because of its real automotive culture. “To me, reading the few magazines available in Argentina and seeing those beautiful cars, feeling that kind of connection to Italy, to the Italian design…that was something that made me dream and imagine… Probably that imagination went even far beyond reality.” These are Horacio Pagani’s words describing the birth of his dream, the desire to come closer to the land that today is awarding him Honoris Causa Degree in Vehicle Engineering. Thanks to those magazines he will meet Leonardo Da Vinci, according to whom art and science can coexist peacefully, “walking hand in hand”. From that time on he will turn this vision into the philosophy of each project and creation: “This vision allowed me to clearly feel the sensation, or better the need, to give an aesthetic purpose to objects, elements which normally have a merely function exclusively.” Each calculation, formula, geometry has to be bended to formal beauty and physical appearance: in this spirit projects like the Zonda and Huayra will come to life, where the attention to detail is evident in each carbon fiber panel and the interweaving of warp and weft becomes a claim to fame, a peculiarity to show on display. An ode to tailored and sartorial works, to craftsmanship, together with the triumph of composite technologies, profoundly studied and developed in the Atelier of San Cesario Sul Panaro. Vicenza, March 2nd, 2018. Dainese and Pagani Automobili work together to give life to a firstrate product. Dainese made its R&D department available to the Modenese Atelier, with the aim of identifying and creating the best possible materials for the fabric and structural parts for the soft top of the Huayra Roadster. Sharing the know-how of these two Italian brands translated into developing sophisticated technical solutions on a par with cars such as the Pagani Huayra Roadster. Inspired by the first flying machine designed by Leonardo Da Vinci, the Ornitottero, the soft top is a combination of components in a Highly Elastic Carbon Fiber Modulus developed by Pagani, which is connected by means of aluminum and titanium billet joints that stretch the technical fabric developed by Dainese. The Pagani Fabric and the structure are the result of a joint development by Dainese and Pagani, the two firms working together to achieve absolute perfection on both a technical and aesthetic level. The Dainese extensive know-how in technical fabrics sector enabled the creation of an innovative material whose different layers, made of refined material and waterproof technology, were specifically developed by the company R&D dpt. The aim was to achieve the right balance between flexibility and resistance across every single zone. Studied like an Origami, the soft top closes in on itself by following the folds of the structural members. This system ensures the durability of the fabric over time and reduces the amount of storage space needed in the car to a minimum. The new soft top on the Huayra Roadster offers both a comfortable driving experience and a one-of-a-kind look. – Pagani Automobili brings two unique vehicles to 2018 Geneva Auto Show. – Huayra Roadster Production ramps up. – 2017 marks the company’s strongest year in its history. Geneva, San Cesario – 23rd of February 2018. 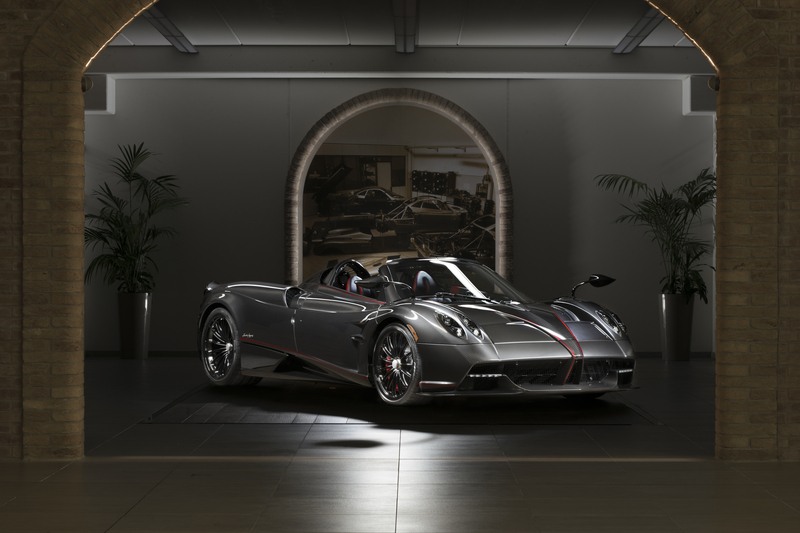 Pagani Automobili is bringing a US-spec Huayra Roadster as well as the Zonda HP Barchetta to the 2018 Edition of the Geneva International Auto Show. The two vehicles perfectly represent the achievements reached by the company in 2017, the strongest year in the history of the Modenese Atelier, with a 29% increase in turnover from 2016. “The limited production run of only 100 Pagani Huayra Roadster is already sold out, and our skilled artisans are creating each individual example in our brand new atelier in San Cesario sul Panaro, combining, as always, Art and Science. We anticipate 2018 to be the busiest and the most rewarding year with the delivery of 40 new vehicles to their respective owners. Our customers started the amazing journey with the tailoring of their new Huayra Roadster to their precise taste and they will enjoy every moment of the building process until the delivery. The journey then gets even more exciting along their road. We bring a US spec Roadster to the show this year as a demonstration of our commitment in developing a global product, complying with the most stringent applicable standards”, says Horacio Pagani, Chief Designer of Pagani Automobili. Pagani is known to give its customers the opportunity to express themselves with the customisation of their personal Pagani vehicle and the Huayra Roadster on display at 2018 Geneva Auto Show is an example of our customers’ finest creativity. In August 2017 Pagani unveiled the Zonda HP Barchetta at Pebble Beach, Concours d’Elegance, a car that represents Horacio Pagani’s personal vision of the perfect Zonda. With this project Pagani confirmed once again its expertise in manufacturing bespoke creations, combining the craftsmanship of an artisan, keen to meet any customer’s desire, with the qualities of an automotive manufacturer, able to guarantee the conformity to the highest technical standards. In 2017 Pagani launched the Rinascimento program, which aims at bringing an older Pagani vehicle back to its original glory with a conservative restoration, maintaining and refurbishing as many of the original components as possible. Not only will this guarantee the correct functionality of the vehicle for years to come, but this certified program guarantees also that the residual value of Pagani vehicles is preserved. The Pagani Huayra BC has spearheaded the development of new technologies and composite materials, which have found their way also in the Huayra Roadster project, resulting in what is today the only Roadster which is lighter than the Coupé it is derived from. Pagani is continuing to increase its Research & Development investments which have grown by 86% in 4 years. In 2017 Pagani has established partnerships in Germany, South Africa, Republic of the Philippines and Southern California to better serve Pagani customers in these territories. San Cesario Sul Panaro, 13th December 2017 – Pagani Automobili officially opens its new Atelier and the Horacio Pagani Museum, which runs through the steps of the Argentinian designer through a collection of his most legendary and exclusive creations. 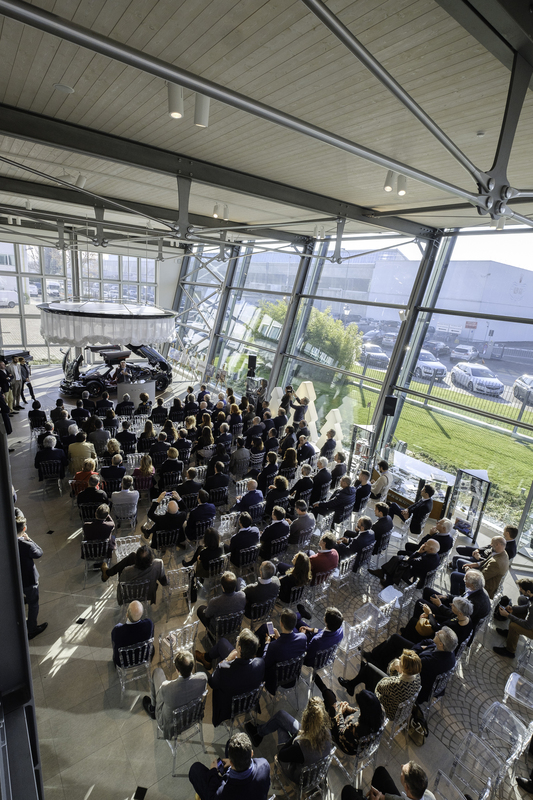 The ribbon cutting ceremony took place in the presence of the founder of Pagani Automobili, Horacio Pagani, local authorities, suppliers and partners. A tribute to passion, dream and determination, a true inspiration, a tribute to automotive art, this is the experience of visiting the Museo Horacio Pagani and the Atelier Pagani Automobili. Together with the very first Zonda models, dated 1998, we find the iconic Zonda Cinque, the Zonda R and the Huayra, unique models exhibited together for the first time in an exclusive collection, never seen before, accessible to visitors from all over the world. The visit is a journey along the most important moments that marked Horacio’s path, from the first significant years in Argentina until today, and deeply explore the conditions that led a young boy to strongly believe in his ideals, pursuing them with passion and dedication, until the realization of his greatest dream: “come to Modena to design and build my own cars”. A unique experience that starts from the Museum and ends inside the Atelier of production, where the visitor can clearly recognise the continuity that links the first balsa wood scale models – already the subject of the important research on lightness – to the latest studies on carbon fiber and composite materials, which interestingly pursue the same goal. From the first projects up to the Zonda, everything in the Museum highlights the great pioneering vision of the young designer who sees art and science walking together hand in hand. A philosophy that took inspiration from a concept of Leonardo Da Vinci and that today represents the soul of Pagani Automobili, where the unique craftmanship skills are tangible in every process and creation. Made with the typical Italian materials, such as Carrara marble and antique bricks as a replica of the typical Modenese bricks, every architectural and stylistic detail of the new building was designed by Horacio Pagani and his team, where the fil rouge of the Renaissance highlights the perfect combination of arte and science, tradition and innovation. Starting from the first Horacio’s sketches, the architectural project was then totally developed by Leonardo Pagani. Behind the Museum stands the Atelier of production, created using the same materials and architectural elements, with the aim to house the exclusive production of Pagani supercars. From the composite materials department to the body finishing laboratory, to the arches that house the making of special models and quality control, every architectural element has been conceived by combining the aesthetic aspect with a precise structural function. Tradition and the most advanced technologies of the automotive industry are harmoniously coexisting together: the Pagani cars come to life in a typical Italian piazza, surrounded by Renaissance arches, street lamps, islands of vegetation, cobblestones floors. A clock placed on the tower on the side of the square tells the time at the ringing of a bell: Ecat, the company that took care of the construction, manufactures clocks and bells since 1404. 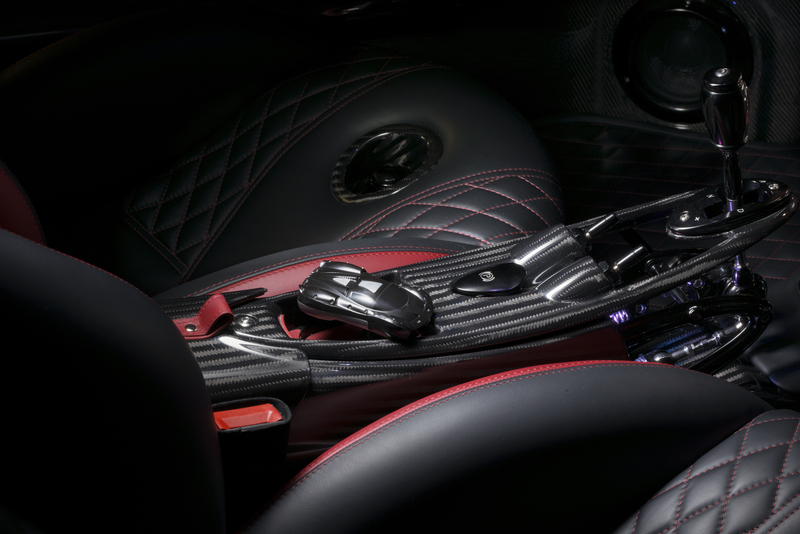 The bricks are made with a special technology ad hoc created for Pagani. Materials such as wood, steel and glass are combined with warmer materials such as wood and bricks. The orientation towards technological excellence, innovation and the increasing attention to environmental protection, find their fullest expression in the Museum and Atelier. The entire building is made with the latest generation technologies and materials, fully adapting to the latest energy efficiency standards. With the mission of enhancing the territory and reducing the environmental impact, were created a photovoltaic system, a water purification plant, a full led lighting system and an energy management system, which allows to monitor savings and consumption, only using renewable sources. Pagani Automobili invites you to the free Open Day on December 16th to visit the Horacio Pagani Museum! San Cesario Sul Panaro, November 15th 2017 – Pagani Automobili is pleased to announce the opening of the new Museo Horacio Pagani and of the new Atelier to the public. The opening will take place on December 16th, 2017 in the presence of the founder Horacio Pagani, in Via Dell’Industria 26 in San Cesario Sul Panaro. This moment sets a new milestone in the history of the company founded by Horacio Pagani: the inauguration of an exclusive collection of limited edition cars that have made the history of the brand, from the first sketches to the latest models of Zonda and Huayra. A journey through history, which brings to light projects never seen before and which demonstrates the pioneering vision of the young designer, together with other exclusive projects of tangible importance. On December the 16th the free entry to the Museo Horacio Pagani is from 10:00 am to 6:00 pm. Pagani Rinascimento is an exclusive programme of car restoration, dedicated to the first Pagani models, with the aim of preserving their integrity and restoring the original splendor of the very first moment they left the factory. A journey through history, through the dream that led to the first creation. The meticulous work of the craftsmen of the Modenese atelier allows to recover the deep soul of the car: with extreme attention to every detail, it starts from the original shape, retrieving the materials, the designs and the skins. Like a sculpture. No bolt or screw is left out during the restoration activity: each component is observed, examined and restored in order to return to the perfect and original blend of art and technology. With the mission of preserving the story, Pagani Rinascimento brings back the unique emotion and the experience of beauty in a custom-made dress. Through the Rinascimento programme, Pagani Automobili offers an exclusive service to customers who want to bring their cars back to the same condition and level of details they had when they left the factory. A conservative restoration aimed at bringing all the damaged parts of the car back to their original condition. A handcrafted artisanal work is carried out on the mechanical parts, on the systems, on the interior of the car and on all worn parts to recover the original appearance and functionality. Pagani Zonda – a story made of emotions. Pagani Zonda is the most celebrated car in the last 20 years, winning in its numerous versions, many Car of the Year prizes and establishing countless speed records in various circuits of the world. A new way to understand the concept of the supercar, where emotions and attention to detail go hand in hand with technological research and the evolution of composite materials. Since the beginning of Pagani Automobili’s adventure, in 1999, 137 specimens were built, each with a specific soul, created as a custom-made dress. Pagani Rinascimento aims to preserve and restore all those cars that have lived in the most diverse places in the world, where certain types of weather have deteriorated parts, or those that have been exploited or driven for many kilometers. Many Zonda customers indeed enjoyed the pleasure of Zonda almost every day, bringing the mileage of their cars to over 100,000 km. Pagani Rinascimento is a journey through history, through the processes that have made Zonda an icon of both Automotive and Design world. A team of highly specialized artisans deals with one project at a time, documenting every single process and signing any carried out activity; all the information including images, drawings and technical data of the work done on the car, are collected in a dedicated Pagani Rinascimento Book (the “Librone”) that matches the existing original one. This allows the customer to be able to certify the car that through this process can be titled as an officially restored Zonda by Pagani Automobili. One of the most important activities to preserve the authenticity is to restore the original components and carbon parts using the same original molds, the same methodologies and the same materials, following faithfully the processes described in the original construction books. A dedicated environment has been created within the new Pagani Atelier in San Cesario Sul Panaro: a workshop where a restoration project of a Pagani car can be shared together with our artisans and customers. A unique journey through the reconstruction process that fascinates the customer and where all the phases are fully documented and shared.